Real political and economic issues hamper gargantuan projects, and that’s where SimCity 2000 breaks down. Oh what wonders the future beholds! Flying cars, jetpacks, teleporters, ray guns. These are the kinds of inventions foretold by The Jetsons, Back to the Future, and other iconic science fiction. Structures like Spaceship Earth at Disney’s Epcot theme park got us excited for the realization of this technological potential. The future is coming, and it’s incredible. 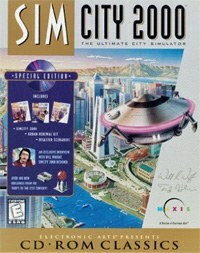 SimCity 2000, a city construction and management computer game released in 1993, played into this utopian vision of the future, as well. The game let’s you build a city from scratch, beginning with a power plant, followed by industrial, residential, and commercial zones. As the name of the game implies, it’s a simulation, so you’ll need to balance the three types of zones as your city expands, while meeting other specific needs of your populace. You can begin the game as far back as 1900, and the technology available to you remains era-appropriate. As the years go by, newspaper headlines announce new inventions that come about relatively in time with their real world creation. For example, subways are invented in 1910, nuclear power in 1955, and solar power in 1990. You also receive rewards for achieving certain population levels, such as a mayoral residence and a city hall. Starting around the year 2000, assuming you’ve met the necessary population requirements, you gain access to arcologies: architectural and ecological superstructures that act as their own all-in-one vertical cities. The earliest of the four models is the Plymouth Arcology. The Plymouth Arco (as it’s often referred) is a monolithic black obelisk with red trim and a huge TV monitor at its base, giving the building a cool cyberpunk/Blade Runner vibe. It can also hold 55,000 people and resist earthquakes, making it the safest high-density building available at the turn of the millennium. The Plymouth Arco is one badass structure, and within SimCity 2000’s balancing act of gameplay systems, it’s also a very powerful asset. I originally played SimCity 2000 around the time of its release in the early ‘90s. All of the inventions up through what was then present day, mimicked the chronology of real world events, setting a precedent for plausibility in the years to follow. The Plymouth Arco debuts around the year 2000 making it the first “invention of the future” in the game. If only we could live in SimCity 2000’s future. Returning to the game now, I can’t help but notice the departure between the game’s timeline and the real world’s recent past that never was. As we move further away from the year 2000, this disconnect is happening at an increased rate across various strands of science fiction media (I’m looking at you, Metal Gear). However, while most science fiction presents itself as such, SimCity 2000 is a simulation game. Now, I realize there’s a flying saucer on the game’s box art and that tacking the number 2000 onto the game’s title is as much a play on ironically futuristic naming conventions as it is some kind of Y2K countdown, but there’s enough accurate chronology, realistic systems, and believable innovations to make me feel disappointed that I’m not typing this from the inside of a real Plymouth Arco. Ironically, I’m more disappointed in the lack of arcologies in the real world than I am of SimCity 2000’s false prophecy, but to be fair, modern architecture and unban planning have gotten us relatively close to the Sim vision. The late architect Paolo Soleri, who coined the term “arcology”, was hard at work for decades on a structure dubbed Arcosanti in the Arizona desert. Arcosanti was designed to be a self-sustaining, hyperdense, ecologically friendly city. Right now, Arcosanti is a series of a dozen or so buildings, housing 50-150 people depending on how many students and researchers are currently on site. A planned mega-structure called “Arcosanti 5000” would house up to 5,000 residents, but it doesn’t seem to have moved beyond the design stage unveiled in 2001. After Soleri stepped away from direct oversight of Arcosanti in 2011, further development was left to his Consanti Foundation and devoted followers. SimCity 2000 designer Will Wright was clearly influenced by Soleri’s ideas, and will even appear in a documentary on the architect, The Vision of Paolo Soleri: Prophet in the Desert, to be released sometime this year. Other arcology projects have been announced and planned in various cities around the world, but none have yet resulted in the condensed vertical cities that captured players’ imaginations in SimCity 2000. I want arcologies that look like spaceships designed by Frank Gehry. I want real forests and rivers inside of glass domes. Moscow has plans for a massive arcology called Crystal Island, which comes closest to matching the model supplied by SimCity 2000. The structure boasts 27,000,000 square feet of floor space and is shaped like an upside-down cone with a flared out starburst base. In short, it looks like the future. Crystal Island is also prepared for high-density residency with 900 apartments, 3,000 hotel rooms and a school for 500 students. Plus, it wouldn’t be a true arcology without prominently featuring sustainable design, which Crystal Island has in its state-of-the-art ventilation and insulation systems and its outer layer of solar panels. Sadly the project was put on hold a few years ago due to the global economic downturn, but maybe it will be picked up again in the near future. Fingers crossed. Real life political and economic issues hamper these gargantuan projects, and perhaps that’s where SimCity 2000 breaks down as a simulation and caves to accessible playability. For the most part, your SimCity 2000 metropolis is self-sustaining, and isolated from the rest of the world’s problems. You can connect to neighboring towns via roads and highways, but whether those cities live or die has little bearing on your own growth. In this SimCity 2000 environ, you won’t find yourself in helpless situations such as deep debt from bond interest payments, no inability to expand, and locked into your tax rates for fear that an increase will push your citizens move away. However, you can get yourself into those situations through mismanagement and poor decisions, but the game will never force a global economic recession upon you. There are no nations, alliances, or trade agreements in the Plymouth Arco. It’s only you and your city. Since SimCity 2000 doesn’t simulate the factors that have consistently derailed real world arcology projects, we shouldn’t expect their invention to follow through on the game’s timeline. And yet, it’s still a shame that arcology superstructures don’t exist. It’s proof that the world can’t keep pace with imagination, even if SimCity 2000’s timeline was never meant to be prophetic.